The Queen Mary II moored outside the 'digue' (floating pontoon) in Port Hercule - four days ago. In the background is Cap Martin. 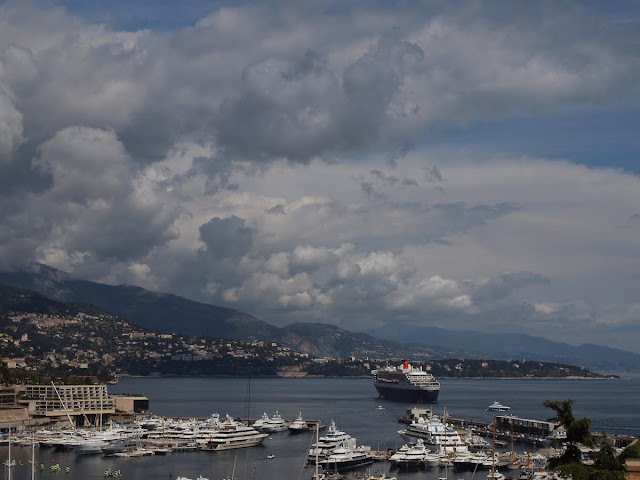 If you go to Menton Daily Photo today you'll find a couple of shots of Monaco taken from Cap Martin. Yes, I took a few great shots as well, and I rode back to Menton in the rain ;-( But it was the only time we had rain so that was good! I would think that would be a lot of people to ferry on and off the ship by tender if the ship cannot pull up to a pier. What a gorgeous scene. The clouds are amazing. Doesn't look as the Ventura, which appeared when we were there.